Virb has gone through several reincarnations since it was launched in 2007. Initially, it was a MySpace competitor. But when it became clear that Facebook was going to dominate the social media landscape, it was acquired by Media Temple and relaunched in 2008 as a website builder. Fast forward six years and, once again, Virb changed hands when parent company, Media Temple, was bought in 2014 by GoDaddy. Did all this chaos compromise the web builder—or did it actually make it stronger? Let’s see. 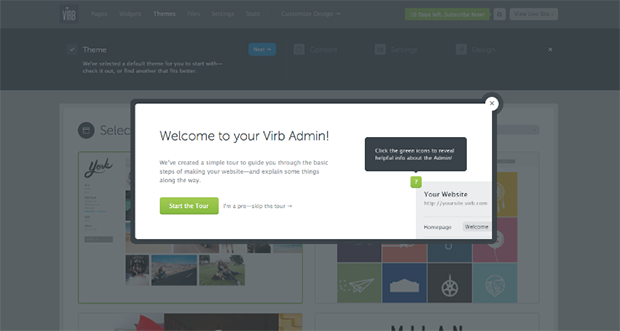 While signing up with Virb, you’ll have to provide basic information like name, email and password. You also will need to be ready with website specifics such as the title and link. You have the option of assigning a category for your site, too. After completing the signup details, you will be taken to the editor. 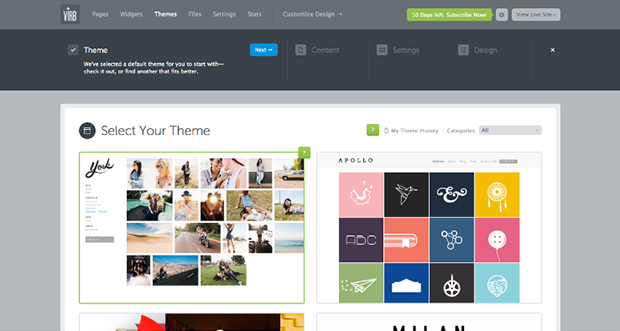 On your first visit, you’ll be offered some useful tutorials and video guides, which will guide you through selecting your theme and adding content, and familiarize you with settings and design. 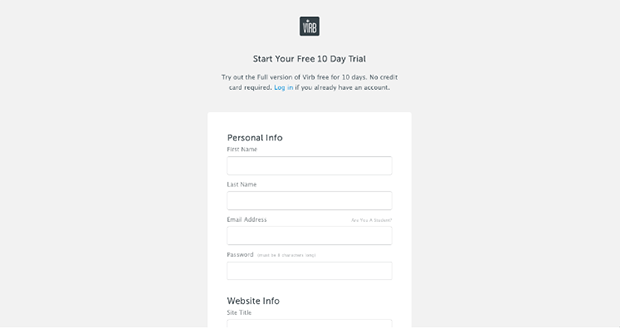 Initially, you will get a free 10-day trial account that you can play with and a domain with a virb.com extension. If you decide to stick with Virb after the trial period, you’ll have to pay for your package. You will notice that an option to register a custom domain is missing from your sign-up process. That’s because there is none. If you want a custom domain, you’ll have to buy it elsewhere; but connecting that domain to your Virb site won’t cost extra. The editor is somewhat outdated. Think of it as a hybrid of your favourite OS and word processor circa 2008. While the majority of the competition is drag and drop WYSIWYG, Virb gives you the option of viewing your editor in two modes. One is where you add building blocks to see the skeleton of your website. The other gives you customization elements like colors, fonts and backgrounds to build upon. Needless to say, there’s a learning curve when first working with Virb. When it comes to options, you will either get all or nothing. There is just one paid plan and there is no free plan if you don’t count the free 10-day trial. This is an exceptionally short trial period; the industry standard is 14 days. If you pony up and commit to Virb, you’ll get unlimited pages, storage and bandwidth. You’ll also have access to CSS and HTML, which give you greater flexibility and control. SEO is provided for each page individually and for the website in general. If you want to check the numbers, there are no native statistics, but there is relatively good integration with Google Analytics. Virb offers almost seamless integration with all the major websites and media sites like Facebook, Twitter, Instagram, Youtube, Vimeo, Tumblr, Etsy and a few more. And if something you need isn’t offered, you can always add custom code via the website editor. All in all, your basic needs will be covered. Unlike the majority of website editors today, Virb is not drag and drop or WYSIWYG. For us, this is a show stopper but not a deal breaker. Why not? Well, because this is kind of an old-school builder. But there is a hint of a “new” website builder where you will see the actual website you are working on. As we mentioned, the editor has two main modes. 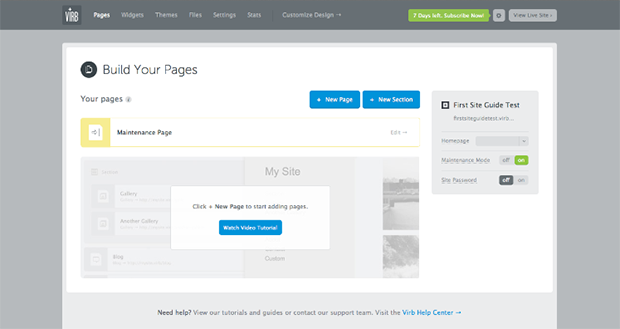 One is where you add and organize pages, widgets and settings for your website. The other is where you customize the look through fonts and colors. First, let’s focus on the “skeleton” part of the editor, to which you will be taken immediately after signup. On the top of the screen, you’ll see a toolbar with several menus: Pages, Widgets, Themes, Files, Settings, Stats and Customize Design. Upload files and connect your Dropbox account. However, bear in mind that media uploaded directly to your Pages (Collections, Albums, etc) is unlimited but your file storage is limited to 500MB. Settings contains general site info and SEO, connected accounts and domains. A brief description of how the builder will look: the menus listed above have a big section on the right of the screen where you will see a list of all the things you have done and can manipulate, such as widgets and pages. On the right, you’ll see small boxes with options to customize the elements you’re working on. For example, in Pages it will show you your homepage, tell you if the maintenance mode is on and indicate if the site password is turned on. For Widgets, it will show you on what pages the widget will appear. Also, we should not forget about two buttons at the top of right side of the toolbar. The small cog symbol hides My Account (settings), Help Center, News, Show Tour, Log Out and View Live Site. Back to the Customize Design part of the builder. There you will see a menu on the left with three main tabs: Design, Pages and Code. Add an additional theme or page CSS, while developer access will allow you to work with CSS and HTML. Bear in mind that there is no autosave or auto publish anywhere in the editor, so be sure to click the Save or Publish buttons before exiting. We counted 26 templates, nicely organized by category. 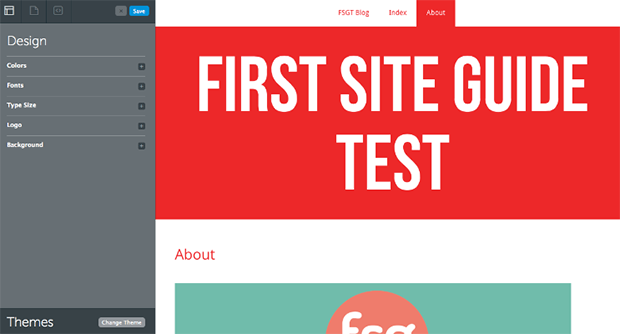 Unlike the editor itself, all looked fairly up to date—and they’re responsive. One of the most convenient features is a theme history that enables you to restore previously used themes with one click. Additionally, if you change your design, all of your files will be there, so while you will have to adjust some things for the new theme, you won’t need to re-upload all of your files or links. Simplicity that we like. With Virb, you’ll need to have a store connected to Etsy or Big Cartel. If you aren’t already connected to one of them, you’ll have to register or sign in to one, which adds a few more steps to the process. This is inconvenient, not to mention the whole third-party access issue. 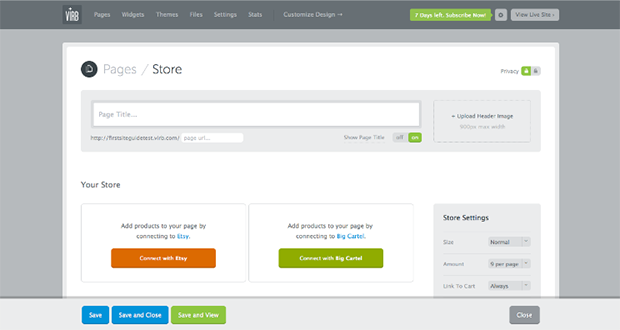 The only store-related settings on Virb are for size, the number of product pictures you want on display and an option to link to the cart. SEO data is scattered all over the place, but not impossible to find. Site description is under Settings and each page on the right has SEO options. There you can add keywords, descriptions and turn the search engine index on or off. It’s basic, but effective for the essentials. Statistics, on the other hand, are non-existent. However, you can easily add Google Analytics and view the stats in your editor. It’s too bad that even rudimentary things, like page views or referral sites, also rely on Google. In-house solutions are ideal, but Virb’s integration with Google Analytics is more seamless than with many other builders. Hosting is handled somewhat amateurishly. Although the company was acquired by one of the largest domain registrars in the world, there is no direct way to purchase a custom domain from Virb, or even to be redirected to a site where you can buy one. Instead, they will host your website, but you’ll have to point your own domain to it. As with far too many web builders, there is no option to export your site. Virb has an extensive knowledge base with video tutorials that’s neatly organized and searchable. Contact forms are also available if you prefer to communicate via email. But their team is only available Monday through Friday, from 9 a.m. to 6 p.m. EST. There is no phone or chat support, so real-time help is not available—a grave transgression in the support world. Either phone or chat support should be mandatory. There is also an option to ask the community a question, but we couldn’t determine where to ask questions and were repeatedly redirected to the Help page. Virb has one plan. A 10-day free trial followed by $10 per month. This includes unlimited pages, unlimited storage, unlimited bandwidth, the ability to connect a custom domain and access to CSS and HTML. Set the clock back five years, and we would say Virb is the website builder you should go to. Since its acquisition couple of years ago, though, it has become stagnant. It seems to be maintained, but not actively updated. While we really loved some of the customization options, design templates backup and how it nicely played with other apps and websites, not having a drag and drop or at least WYSWIG editor seems like a serious drawback. Also, the lack of in-house solutions like buying a custom domain, stats or e-commerce, forces you to use third-party solutions.This will make you feel like you’re going zig zag when you should be able to go in straight line. One of the final nails in the coffin was the missing the real-time or 24/7 customer support. While we appreciate the simplicity of one plan that covers a lot, having options is always good. In the end, we can’t recommend this website builder without major hesitation. It may be your choice, especially if you like the retro functionality, but other website builders offer more plans, including plans that are free.